We talk a lot about the wonderful Brunswick County areas of North Carolina that we have have vacation rentals, real estate, etc. But we rarely talk about ourselves directly. Here, we go into detail About us – the Sloane Family History. In the Spring of 1955, George Sloane Jr. came to Ocean Isle Beach, North Carolina, and moved with his family into, what was then, the McLamb House. At the time – post Hurricane Hazel — the home had shifted off its foundation but had survived. From 1955 to 1964, when the island still had only clay roads, the Sloane family was the only permanent resident. But it’s here, that George Sloane Jr. built the first Ocean Isle Motel on the same spot that Ocean Isle Inn sits today. Rae Sloane, along with her husband George, arrived with two toddlers, took one look at the empty stretch of flat, desolate sand and thought, "\Oh my, what have we gotten ourselves into?" 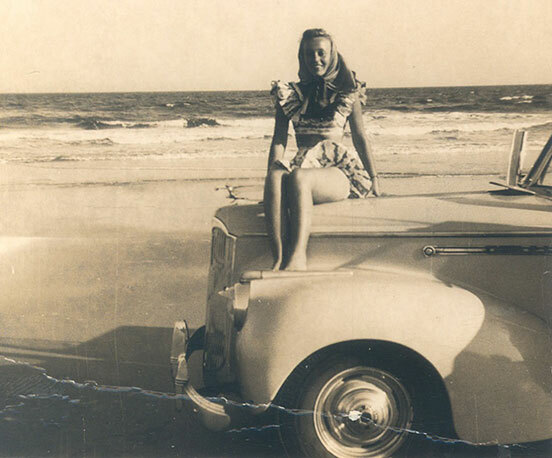 Just eight months after Hurricane Hazel had completely devastated the barrier island, local developer Odell Williamson hired young George Sloane, a former merchant marine and graduate of the University of South Carolina in Columbia. "Williamson said he wanted a young man living on the island to sell the lots," Rae says. "George said we were going and off we went." The couple made the best of it, moving to an uninhabited island, renting a home that had been returned to its foundation, and selling island lots for a small commission. "It wasn’t easy," Rae says, "but it was ours." And that was the year that Sloane Realty was formed. Rae, a native of Loris, SC, was used to hard work and long hours. She grew up working the tobacco fields in Horry County with her family. Determined to work in an air-conditioned office one day, she graduated business school and did just that for a short time before marrying George. The first winter on the island was tough on the family. "That was when oceanfront lots were selling for $500. There’s not a lot of income from that as you can imagine," she says. They headed to Florida, where George took a full-time job for four months, and then returned to Ocean Isle in the spring. Ocean Isle Beach has been their home ever since. "From then on, we could get enough oysters and fish and shrimp to live off of," Rae says, adding that her parents brought them cornmeal and grits and homegrown vegetables. "Tripp’s favorite times were when the fisherman would build a fire, split open a mullet and roast it on a cedar stick," Rae says. "That and a hot sweet potato fresh from the coals were the best eating he ever had in his life." "It was," Tripp says in agreement. "Some of my fondest memories are eating with the fisherman on the beach." Access to the island was limited by a small, two-car ferry. Each day the ferry stopped running at 11 p.m. and didn’t start again until 7 a.m. the next day. "We had to take the kids across the ferry to meet the school bus in the early years," Rae says. George and Rae expanded Sloane Realty to include the waterfront, six-room Ocean Isle Motel, where they lived in an apartment on-site. "There weren’t any roads then, and the sand was so thick, we had to tow our first customer all the way in with our four-wheel drive truck," she says. "Then when they left we had to tow them back out." "The motel office was our living room," Debbie recalls. "Guests felt right at home." 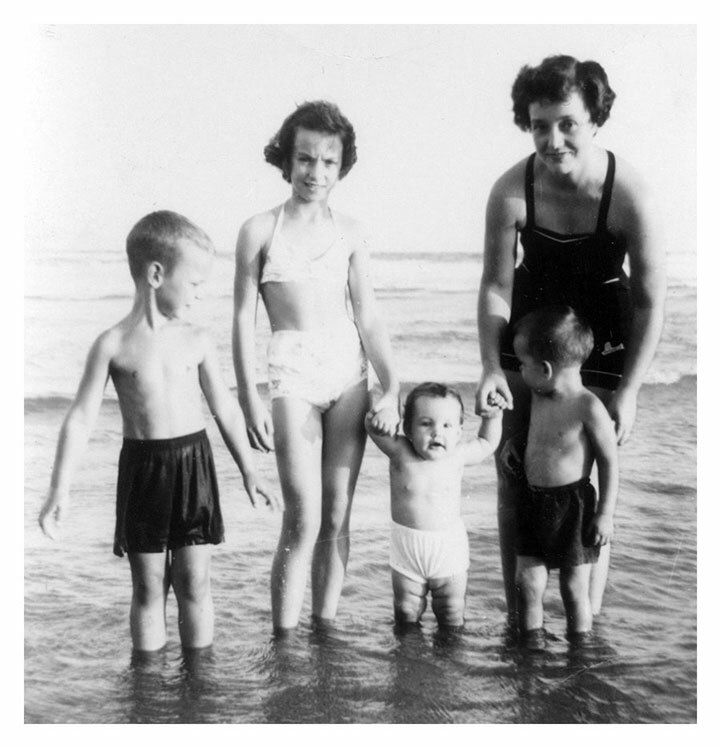 Ocean Isle Beach was incorporated in 1959, the same year the Sloane’s third child, Pamela, was born. She is the first native of Ocean Isle Beach. "That year, the World Book Encyclopedia listed the little island community as the smallest, incorporated area in the world, with five residents," Debbie says. "It was our family." New landowners built small vacation homes here and there, but development of the island was slow to start. There was a slight spurt in the 1960s, but the real boom came in the 1970s. George was the third mayor, and Rae was the first town clerk for the small community. "George did so much for the island, really," Rae says. "He even collected the garbage for years. He did it all." "We felt like we had the run of the place," Tripp says. "What few people that were here were locals that had come over for the day or property owners that we knew, or vacationers that we knew because we were renting to them." George expanded the family business venture with partner Gene Hardee and opened The Breakers, where Pam operated the bingo room and Tripp and Debbie ran the grill. "It wasn’t a real money maker as you can imagine," Rae says. "The kids gave nearly all the food away to their friends." Eventually Tripp and Debbie went on to college at The University of North Carolina at Chapel Hill. Debbie got married and moved to Wilmington. A tragic car accident in 1971 took George’s life. Tripp came home to help with the family businesses, and Debbie soon followed. "It was the middle of summer," Rae says. "We couldn’t stop. The boom was on." All three children got their real estate licenses. But Pamela, whose last name is now Yolo, decided not to stay with the family business, but she lives locally and is married to the town fire chief. Rae married Connor Cox in 1978, and he joined her on the island, even serving on the board of commissioners for a time. When his health began to fail, Rae moved them off the island into a condominium overlooking the Intracoastal Waterway. "I can see the beach from my balcony," Rae says. "I am not too far away." "She can see everything we do," Debbie adds, laughing. Debbie has been the mayor of Ocean Isle Beach for the past 12 years and served on the town council for 16 years before that. It is a position she doesn’t take lightly. "It is important to give back to the community," she says. "This is home." "We wanted Ocean Isle to grow in the manner that it has grown," she says. "We didn’t want it to become another Myrtle Beach." The family has been a living witness to the complete history of the island community, including the establishment of a swing bridge to replace the ferry in 1960 and the construction of the arch bridge to replace the swing bridge in 1986. The town hosted the first Oyster Festival in 1980 and continues to do so to this day. The island now has nearly 5,000 houses and condominiums and a combination of lush landscaping and miles and miles of large, grassy dunes. The old Ocean Isle Motel has been replaced with the new, 70-room Ocean Isle Inn. "We are primarily in sales and rentals," Tripp says. 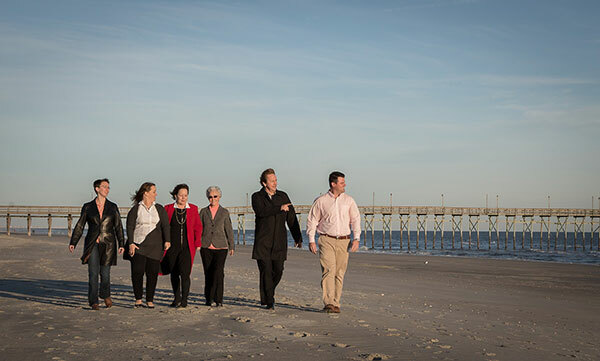 "We manage well over 300 properties on Ocean Isle alone." Sloane Realty also has two offices in Sunset Beach, managing both beach and golf condominium rentals and real estate sales. There are three additional hotels, a gas station, a police department, a fire station, a town hall, a fishing center, a miniature golf course, a variety of shops and a handful of restaurants that makes for a vibrant community. Fewer than 600 permanent residents make their home on the island, but the summer vacationers increase the seasonal population to 25,000. 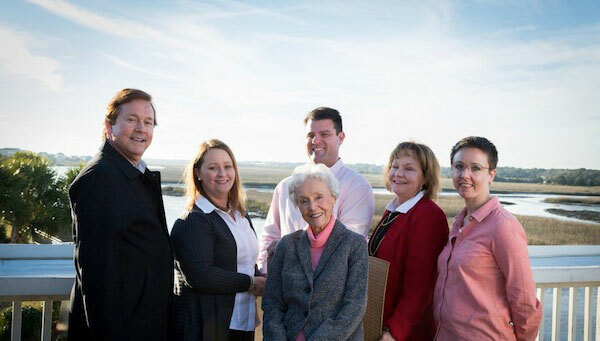 Island staples for 60 years, Sloane Realty and the Ocean Isle Inn are now run by the third generation of Sloanes. Together, the businesses employ more than 50 local residents. During the summer months that number more than doubles with seasonal employees. Debbie’s daughter Whitney Sauls joined Sloane Realty immediately upon graduating from the College of Charleston and is now the general manager of the rental division. Tripp’s stepson, Chris Bryan, is the sales manager for the real estate division and Tripp’s daughter, Leah Petersen, works in the accounting department. The members of third generation run the day-to-day operations now; however, Tripp and Debbie are both involved. "I grew up in this office," Whitney says. "But when I came back I started at the bottom, they put me at the front desk." Nearly all of the grandchildren were put to work at one time or another over the years, answering phones, cleaning rooms and picking up trash in the parking lots. A member of the fourth generation took a summer job filing in the office last year. Rae and George Sloane created a lasting legacy at Ocean Isle Beach, with three children, 13 grandchildren and 11 great-grandchildren, many of who remain local. So very many years have passed, but Rae loves to reflect back on the very beginning. "When that ferry closed down at 11 o’clock at night, and we would put the kids to bed, we would take a quilt out on the beach and lay under the stars," she says. "You’d have thought we were in heaven."